This is the time of year when many people start to think ahead to holiday dinners, family gatherings and other social events. 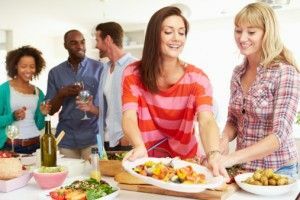 If certain parts of your home aren’t all that you would like them to be, this may also be the time when you start to get anxiety (or even perhaps go into a full-blown panic) at the thought of friends and family coming over for your winter events. Your home doesn’t have to be a source of holiday stress, though. There is still plenty of time to complete a home remodeling project long before you need to start preparing for your holiday events. You can have an impressive new space to show off during your late-year entertaining. This will allow you to be much happier and less stressed. Not to mention, it may open up new possibilities for entertaining, especially if it allows you to take advantage of space that previously wasn’t very useful or didn’t comfortably accommodate guests. Holidays with friends and family are always enjoyable, but they can be even better when you have a great space in which to make new memories and spend good times with the important people in your life. Give yourself and your family a holiday present you will enjoy for a long time to come! For home remodeling in Arizona, contact RW Remodeling.